Recent release ‘The Lost Heir” from Page Publishing author Reilly Woodhouse is a beautifully written account that follows a woman’s years of growth filled with heartrending circumstances and how she overcame them through courage, faith, and resilience. Reilly Woodhouse, the fifth of six children and an imaginative writer, has completed her new book “The Lost Heir”: an evoking tale of a woman’s purposeful life, beginning with her childhood, passing through an adolescence of self-crisis, and finally to adulthood as a dangerous person. Published by New York City-based Page Publishing, Reilly Woodhouse’s passionate opus conveys the important message of finding one’s self and solidifying one’s identity without faltering in a world full of caprice. 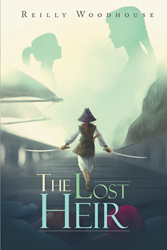 Readers who wish to experience this work can purchase “The Lost Heir” at bookstores everywhere, or online at the Apple iTunes store, Amazon, Google Play, or Barnes and Noble.